Karen Laurence-Rowe was born in Uganda, daughter to a civil engineer. Living a nomadic existence, her childhood years were spend trailing across eastern Africa watching her father carve roads into a land teaming with game and sweeping landscapes – an Africa virtually unspoiled in the early sixties. Karen has lived in Africa all her life and currently resides in Kenya where the extraordinary wildlife and landscapes continue to capture her imagination and fill the canvases and surfaces that she works on. Over the last few years her attention has turned more and more to the conservation of wildlife and endangered species, which her work clearly reflects. 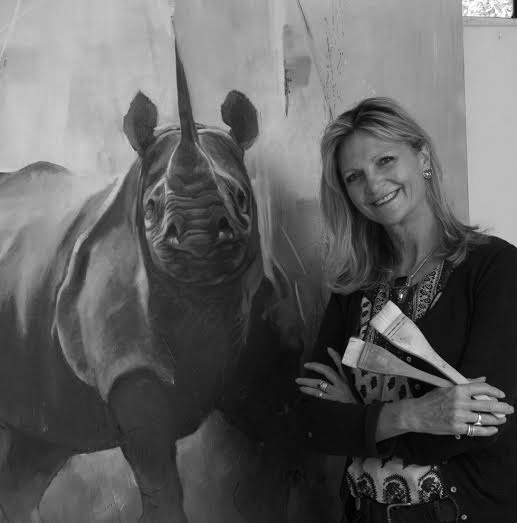 Many of her paintings are donated or part donated to conservation groups struggling to cope with poaching and the result of human encroachment into the wild spaces of Africa – this has recently earned her the Simon Combes Conservation Artist Award in Canada (2015) and the David Shepherd Wildlife Artist of the year in 2012. An extremely versatile artist, Karen has the ability to switch easily from oil on canvas to watercolour or pencil – she finds the joy and meets the challenge in whatever medium she chooses. Karen’s paintings now grace the walls of many an art lovers all over the world, including the renowned collection of his highness the Aga Khan. It is her variety of styles and subject matter that give her work such a wide appeal and contribute to her fast growing success as an artist.